At Goodlife Chiropractic at King Harbor, we aim for our patients to be as relaxed and comfortable as possible. 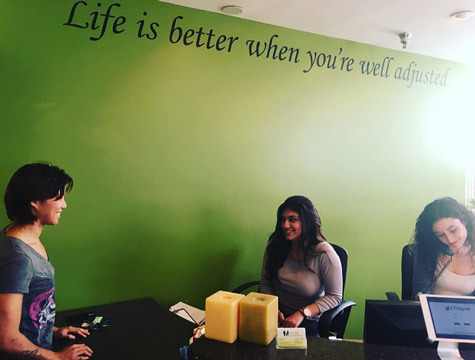 When you enter our office, you’ll be met with good energy and smiling faces from our staff. We believe in creating a fun and engaging experience for our patients. When you arrive at our office for your first visit, we’ll ask that you complete some brief paperwork that should take about 10 minutes. Next, Dr. Donohue will perform a thorough examination to determine the cause of your pain and to make sure you’re a good candidate for chiropractic care. Then, Dr. Donohue can speak with you about developing the best type of treatment plan. Following your examination, your doctor may perform a gentle chiropractic adjustment that only takes a few minutes. At Goodlife Chiropractic at King Harbor, we know our patients lead busy lifestyles and are very conscious of your time. In addition to an adjustment, we’re happy to provide our patients with corrective exercises and counseling on proper nutrition that can help provide the best quality of life to keep pain away. Many new patients have heard it before: once you go to a chiropractor, you must continue care for life. We believe this couldn’t be further from the truth. The treatment plan put in place for you by your chiropractor will be something that works with your schedule. We’ll never make a patient come in for more visits than they want to. Our goal is to get you feeling better quickly so that you can get back to enjoying your life. We look forward to helping you live better!